I have begun 2015 by embarking on the mammoth task of producing hi-res digital files from my Uncle Jan (Greshoff’s) film archive. (My brother Martin is already well underway with the lower res scans and he regularly uploads some of these to the Jan Greshoff facebook page: (https://www.facebook.com/Jan.Greshoffs.Photographs?ref=br_rs). So I have got my film scanner out of retirement and have upgraded my software but it still takes forever and the post-production takes even longer but it is actually quite refreshing not to be working on my own work with all that entails and to be putting myself in someone else’s mind to try and produce the kind of images that he would have printed. We have lots of his prints so it is relatively easy to see the kind of quality he was aiming for. However, I digress… during a New Year sortout I came across a small pile of pinhole prints from negs that I did in the early 1990’s with an adapted Sinar. As my scanner is out again I thought I put them through and here they are. There are a few more tucked away somewhere but someone else can scan those when I am pushing up the daisies. I just love the feel that pinhole images produce and still find it entirely amazing that they are possible in the first instance. I shot a few more a couple of years ago, using my last remaining large format camera (all the Sinars being sold off ages ago), a baby Linhof but the rolls of film are still waiting to be processed I am ashamed to say. I even bought a 6×12 custom-made wooden pinhole camera that is still waiting to be used, I am even more ashamed to say! Maybe 2015 will be the year of dusting off my processing cans and reels as well as my scanner. These are the fine bridges that are a signature feature of Conran’s Butlers Wharf development just east of London Bridge in SE1. It wasn’t long finished then. This entry was posted in Architecture, Cityscape, Landscape, London Architecture, London Panorama and tagged Architecture, Black & White, Building, Canary Wharf, Greenwich, Landscape, Large Format, London, Market, Oxleas Wood, personal, photography, Pinhole, Smithfield, structure on January 5, 2015 by greshoff. I recently completed a shoot at a deserted National Gallery in London after hours. I took the rare opportunity of being able to use a tripod unmolested and looked up. This entry was posted in Architecture, Heritage Architecture & Restoration, London Architecture and tagged Architecture, Building, color, Colour, Dome, Exhibition, Gallery, heritage, London, National, structure on September 24, 2014 by greshoff. It has been a while since I last posted anything here. 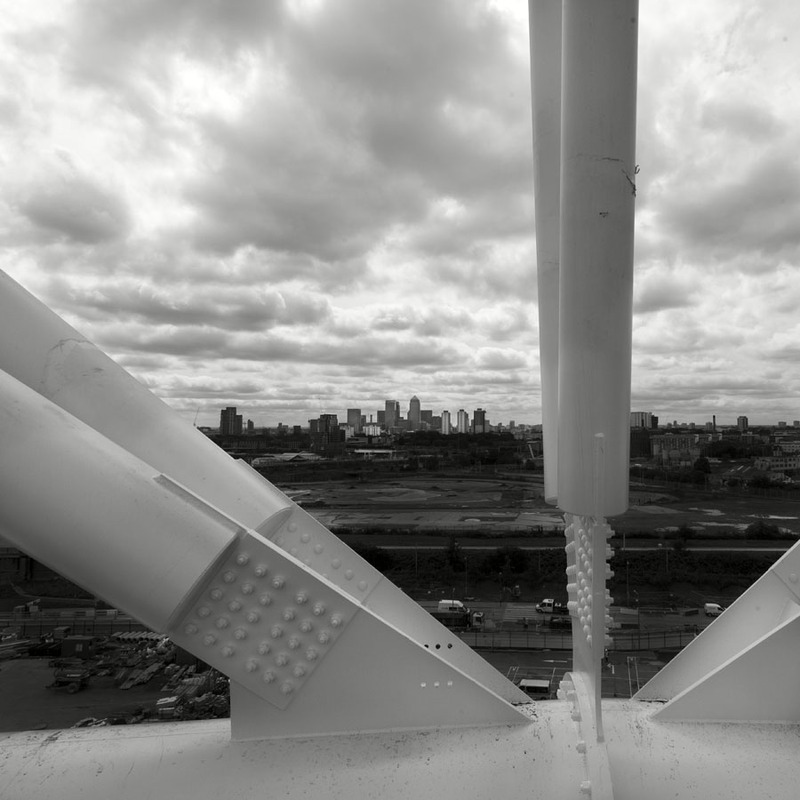 this has been due primarily to the pressures of my commissioned work but while I was shooting at the Olympic Stadium project today I took this from the very top of the structure. It wasn’t the best lighting but it remains a fine view and one that is not often seen and once the project is complete it will be seen even less! This entry was posted in Architecture, Cityscape, Engineering, Landscape, London Architecture and tagged Architecture, Balfour Beatty, Building, Buildings, Design, Docklands, Engineering, Happold, landcsape, Landscape, London, Olympic, personal, Roof, structure on August 28, 2014 by greshoff. I was lucky enough to receive, from Kate at #Updown Gallery, a complimentary ticket to this year’s Art14 show at London Olympia. It was an interesting few hours and also allowed me do dust off my happy snapping camera that I haven’t used for a while. Follow Robert Greshoff This is a piece by Stephen Melton being closely examined by a small child and her parents. This entry was posted in Architecture, Cityscape, London Architecture, Personal, Retail and tagged art, Art14, Fair, Fine art, Interior, Kensington, London, Olympia, personal, Show on March 2, 2014 by greshoff. Did this while waiting for my subject during a portrait shoot at Mastercard yesterday. Makes London look like the great city it is! This entry was posted in Cityscape, Landscape, London Architecture, London Panorama, Retail and tagged at dusk, cityscape, Colour, Docklands, Landscape, London, Nuit, Thames on February 19, 2014 by greshoff. This entry was posted in Architecture, London Architecture and tagged Architecture, black&white, BW, distribution, Industrial, Sheds on February 7, 2014 by greshoff.